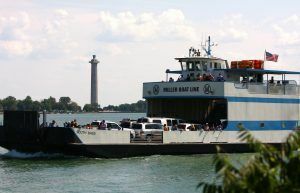 The most affordable way to travel to Put-in-Bay, the Miller Ferry leaves from Catawba Ohio every half an hour from June 15th through August 19th. The Miller Ferry is ideal when traveling in a large group or transporting a vehicle such as a car or motorcycle. Reservations are not required to ride the Miller Ferry. The schedule is a little more restricted than the Jet Express Ferry. The last trip back from Put-in-Bay to the mainland at 7pm on weekdays and 9pm on weekends. There is a reduced schedule beginning March 30 and after August 19 with service suspended after November 21. Please note there are additional fees for trailers. Docking at the Miller Ferry Lime Kiln Dock on the southern tip of South Bass Island, the Miller Ferry takes thousands of visitors to the island every year. Dockside Gifts is also located at the dock. This gift shop sells souvenirs as well as snacks and cold beverages. There are a variety of Put-in-Bay discounts and coupons which can help make your trip even more affordable. Visit their website for further details but discounts include group discounts, season passes, and Frequent Floater tickets which all save you money on your next trip to the island. Frequent Floaters are convenient packages which make it easy for families, friends, and businesses to “Share the Island Fun”. Twenty one-way tickets are available, each at a discounted price. Purchase Frequent Floater packets at the Miller Ferry Catawba ticket booth, the Lime Kiln Dock ticket booth on Put-in-Bay, or at the Miller Ferry office, Bayview Ave., Put-in-Bay. A Miller Ferry Gift Card is a very thoughtful gift for friends and family traveling to the island for the first time. They are also reloadable. The staff at the Miller Ferry are very helpful when it comes to arranging travel plans for large groups. Contact the Miller Ferry to hear about package deals for school groups, bridal parties, and business retreats. 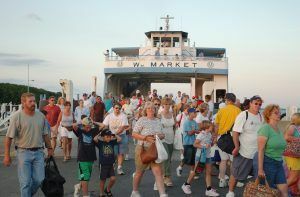 These packages also helpfully include dockside luggage drop off, complimentary passes for motorcoach driver and tour guides, and coupons to many Put-in-Bay attractions. Once you arrive on South Bass Island, contact Island Club Taxi to take you to your final destination. There are also sever bike and golf rental companies near the dock including Island Bike Rental and E’s Golf Cart Rental.